Sometimes you may see the message saying that upload is successful, but files appear to be not uploaded; this may indicate a server error, but not necessarily. In this case, please, firstly check that you specified at least one Converter, your upload script actually saves files (see the Saving Uploaded Files in PHP topic), and you are looking for files in the correct folder. Image Uploader cannot save uploaded files because of wrong permissions configuration. See the Configuring PHP topic to learn how to set required permissions. The request size is too big. See the Configuring PHP topic to learn how to increase maximum request length. There is an error in your upload script (specified with the UploadSettings.ActionUrl property). See the debug approaches described below to find the error. If you experience an issue having different sympthoms than those described in this article, please, see the Basic Steps in Troubleshooting topic. Error logging approach is more convenient for production applications. It catches all the exceptions and writes error details to a log file; it does not show any information about errors to users. Event handling approach implies showing the server response when some error occurs. If displaying errors is enabled, this response contains error details. However, this approach requires some modifications of Image Uploader settings. Using sniffer allows you to view server response without necessity to modify embedding code, but it uses a third-party tool. Running script in debug mode means debugging PHP scripts in the same manner as standalone applications. Optionally, you can set a limitation for the error file length using the log_errors_max_len parameter. 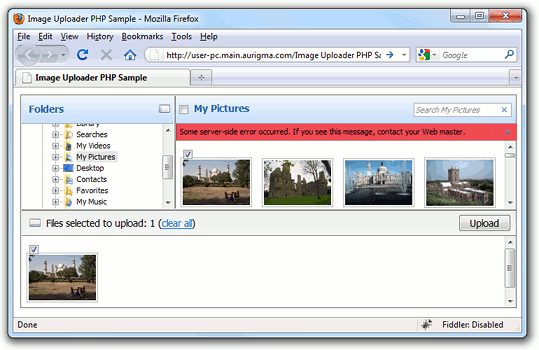 Image Uploader provides two events which are helpful for debugging, namely, Error and AfterUpload. The first one fires when a server or client-side error occurs, and the second fires when an upload is supposed to be successful. We recommend you to handle both events simultaneously to get debug information on server errors because there is a known problem with PHP applications: they can return HTTP code 200 (in our case it means successful upload) even if some error occurs. The Error event provides detailed description of an occurred error through the errorPage parameter which represents the web page returned from the server. To ignore non-server errors you can use the errorCode argument, since it is equal to 4 in case of internal server error. For the full list of error codes, please, see the Error event parameters paragraph. Make your upload script to return some predefined response after all the uploaded files were saved. In the AfterUpload event handler check whether a string returned by the response parameter contains the predefined one. If this check is failed, it means that an error has occurred and the response parameter contains the error-related information. The following example shows how to display error details if a server-side error occurs. If error details are not displayed, make sure that display_errors parameter in your php.ini is set to On. As an example of network analyzer tool we use the Fiddler. Here we discuss how to use it to debug server-side upload script. Open index.php in your browser. If it is able to send traffic to Fiddler, the corresponded session will be displayed in the Web Sessions pane of the tool. Send a file via Image Uploader. Double-click the upload.php session in the Web Sessions pane. Find upload session details in the left part of Fiddler's interface. Here it contains the POST request sent by Image Uploader and the response returned by your upload script. If your upload script contains an error this error details will be displayed in the returned response. Basically, PHP does not support debugging, but you can use third-party debuggers, such as Xdebug. You may use Xdebug with different IDEs (for example, with Eclipse), the Debugging PHP applications with xdebug article tells how to use Xdebug with Eclipse. As well, you may use an IDE which supports debugging PHP scripts, such as CodeLobster PHP Edition.